These two mini bulletin board sets perform essential functions for your class while the Upcycle Style brings the cozy feel of realistic-looking material, playful textures and fun fabrics to classroom decor. This creative, charming look will make any classroom feel warm, friendly and inspiring. 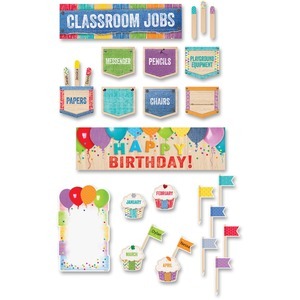 The Happy Birthday Mini Bulletin Board Set includes 50 pieces: one Happy Birthday headline, 12 month cupcakes, 36 student mini flags, one blank frame and a display guide. Pieces range in size from 2-3/8" x 5-1/2" to 21" x 6", and cupcakes are approximately 5-3/8" x 5-1/2". This Upcycle Style Classroom Jobs mini bulletin board includes 52 pieces 10 pre-labeled job pockets (Playground Equipment, Pencils, Chairs, Messenger, Pets, Doors, Line Leader, Papers, Supplies, Plants), five blank job pockets, and 36 student job sticks. Title headline measures 21" x 6", and the job pockets measure 5-3/4" x 5-1/3". Both mini bulletin board sets complement other Upcycle Style products.